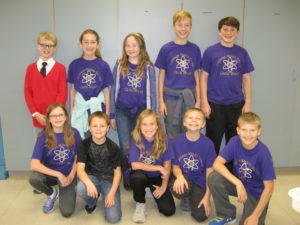 The Holdrege Middle School quiz bowl home meet was held on Wednesday, November 14th. The 7th and 8th grade team competed at 8:30 in the morning. 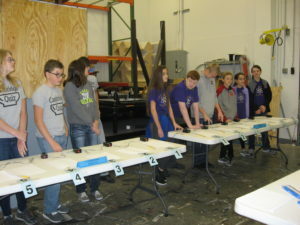 There were 12 teams involved including Holdrege Purple, Holdrege Gold, Cambridge Black, Cambridge Orange, Bertrand, Shelton, Franklin, Loomis, Arapahoe, Alma, Minden, and Axtell. There were two pools of 6 teams that competed in round robin play. The top two teams from each pool then went head to head. In the end, the two Holdrege teams battled it out for first and second place. It was a close, tense, but fun round with Holdrege Gold winning first place. This team consisted of all 7th graders with the exception of Justin Golus who served as the captain of the team. In the afternoon, the 5th and 6th grade team competed. The set up was the same with Holdrege, Axtell, Arapahoe, Cambridge, Minden, Loomis, Southern Valley, Wil-Hil, Bertrand, and Elwood competing. Holdrege went 2-2 in the round robin play and did not qualify for the finals. However, they are a pretty inexperienced team and this was their first actual meet. 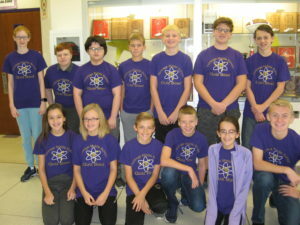 They did compete in an online meet last week called the Great Plains Quiz Bowl that includes about 25 teams from across the Midwest. They scored 1306 points and earned first place in that meet. Both teams will compete in Cambridge on Monday, Nov. 26 at 4:30 in the afternoon.